With that being said, our office’s primary focus is the economic and revenue forecast for the state which focuses on the aggregate figures (total jobs, total wages, overall cigarette and tobacco sales, etc.) 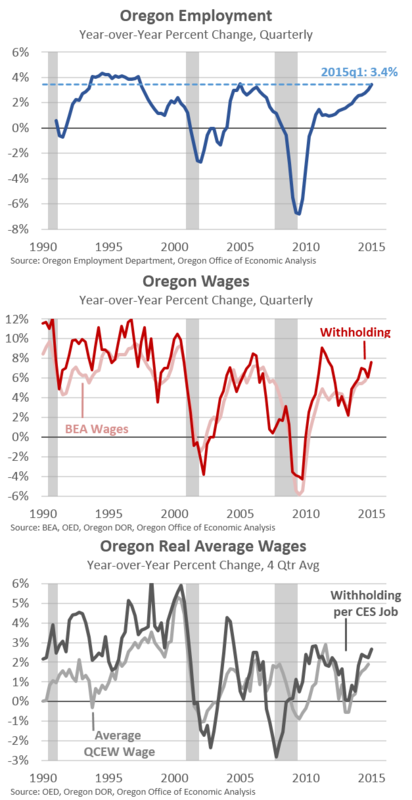 From this top-line vantage point, Oregon’s growth is doing well. While we expect strong growth to continue in the near-term, such growth is already built into our baseline forecast. The key question is whether or not we and our advisors think growth will be a bit stronger, or potentially a bit weaker, that what we already have built into the outlook. We cannot discount the real possibility that in a few years’ time, we will look back on today as the peak of the business cycle in terms of growth rates. So this may really be as good as it gets, even as the recovery still has legs to run before the next recession.